It's football time in Tennessee! Tomorrow is the first game of the season, and you know what comes with that? TAILGATING! That word can be a healthy eater's worst nightmare. So what do you do to stay on track? 1. Scope Out the Spread — See what all the options are so you can make the best choice and what to choose. If there are so many things you just can’t resist, just pick one. Pick your favorite. Remember to ask yourself if it’s worth it. 2. Bring a Healthy Dish — Not sure what is going to be available?? Try this alternative for Honey BBQ wings! Bring a dish or two that you can eat, and stick to them! Going to be tempted by dessert? Bring some vanilla Greek yogurt, diced strawberries, blueberries, and granola and set up a yogurt bar! 3. Fruit, Veggies, and Protein — There will usually be a fruit and veggie tray. Fill up your plate with these! Go for some lean, grilled protein. 4. Drink Water — This isn’t an issue for me because I don’t drink. Remember, you don’t have to drink to have a good time, and you’ll be consuming WAY less calories. 5. 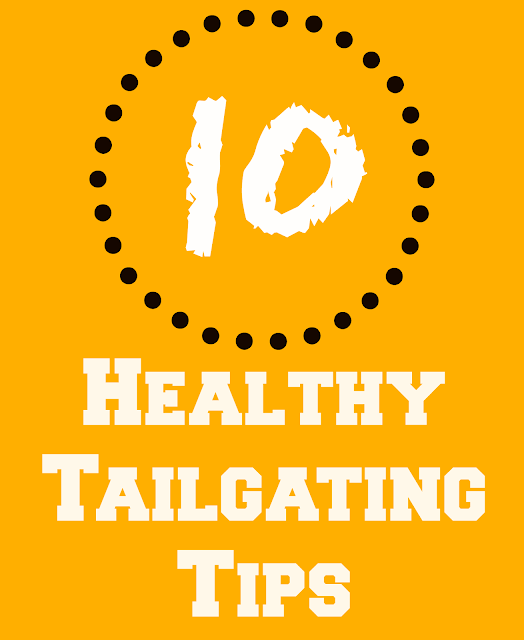 Eat Beforehand — Don’t come to the tailgate famished! If you are really hungry, your willpower will go right out the window. Eat something beforehand so that you are tempted to just pig out. You can even do a quick workout before you go – that always makes me more health conscious. 6. Focus on the Game — Make it about the fellowship and the game, not about the food. Our culture wants to make everything about food. Switch that mindset and focus on the point of the occasion. 7. Be the Host — Host the party and you’ll be in control of what is served. That way, you can ensure that the menu will include plenty of healthy options. 8. Moderation — Be conscious of your portion sizes. Don’t overdo it! In the long run, will it be worth it? It might seem great at the time, but the next day you’ll be kicking yourself. 9. Avoid Slippery Slope Foods — You know you have those red light foods that once you start eating them, you can’t stop. Don’t even let yourself take the first bite (you’ll thank yourself later). Avoid the mindless munching! 10. Move Away from the Table — Constantly standing by the food is just going to result in more eating of the food. Fix your plate and then move away from the food. Going to football games with dad is a cherished memory. Dad was so funny - he hate sitting in traffic, so he left at the end of the third quarter - no matter what! Dad always got awesome seats, too. I hold all those times with my dad near to my heart. These are some great tips. It is the special events where I always struggle to stay on track! Football abounds at our house too! My hubbie is a huge Michigan fan! I hope they help! I know I have to make a game plan or I won't survive. I'll just keep snacking!